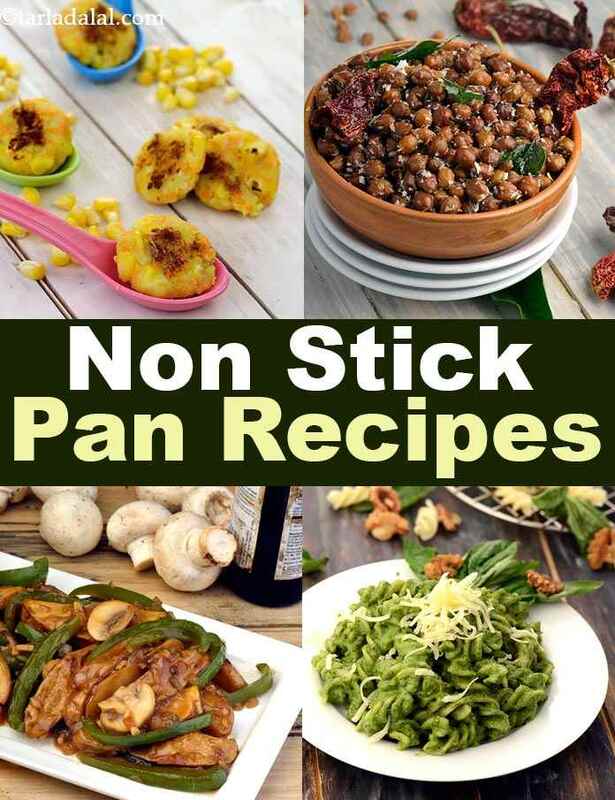 Non-stick pan Indian vegetarian recipes collection. One of the most disruptive innovations in the culinary space, Non-stick pans have found a wide fanfare as they allow cooking of foods with little or no oil and other fats like butter, ghee, and so on. Non-stick pans, usually made by coating a pan of aluminum or other alloys with Teflon, have non-stick properties, that is, food does not stick to them. However, their utility is only as long as the surface is not scratched. Hence, it is advised to use only wooden, silicone, polycarbonate, or other blunt ladles with such pans. It is also better to clean them with mild soaps and sponges rather than metal scrubbers. Non-stick pans are available in different forms and volume. They may be deep, shallow, broad or small. They may be shaped like tavas, kadhais or saucepans. Deep non-stick pans are ideal of deep-frying and cooking Indian sweets or subzis. Snacks/ appetizers like Spicy Creamy French Fries, Crispy Fried Vegetables, Fried Potatoes in Ginger Mushroom Sauce and Fried Dosa Strips with Honey Chilli Sauce will be loved by both adults and kids. We urge you to visit this section and try out some wonderful recipes like Mixed Vegetable Subzi, Aloo ki Sukhi Subzi and Broccoli Aur Paneer ki Subzi. Serve them along with piping hot roti for lunch or dinner. End your meal with delightful Fresh Pineapple and Dry Fruit Roll or Makhane ki Kheer made in a deep non-stick pan. Popular Indian appetizers like tikkis and cutlets are generally deep-fried in oil to give them a crunchy outer texture. But, most people are becoming health conscious nowadays so, they prefer cooking methods like shallow frying which makes use of less oil. Bread Cutlets or Cheesy Corn and Vegetable Cutlets can be made in a broad non-stick pan and can be stuffed inside a burger bun or eaten as it is with tomato ketchup. They will surely be loved by kids! Broad non-stick pans are also feasible for tossing vegetables together to cook a dry subzi or a stir-fry. You can even make Indo-chinese rice and noodles preparation without them becoming clumpy. Garlic Noodles, Paneer Fried Rice, Hakka Mushrooms with Rice Noodles with a range of veggies, not to forget soy sauce and other flavour-enhancers are tongue-tickling. Enjoy them as it is or serve it along with a bowl of Manchurian or hot & sour gravy to make a satiating meal .Also, baked dishes like Baked Kidney Beans with Alfredo Sauce, Baked Rice with Green Curry and Baked Stuffed Mushroom Pancake, can be made using a broad non-stick cookware. When you use a non-stick tava, you can reduce that amount also greatly. Try your hands on delectable snacks like Chana Dal and Cabbage Tikki, Sprouts Tikki, Broccoli and Paneer Tikki makes use of minimal oil and are yet tasty & healthy at the same time. Serve these light on stomach tikkis with healthy green chutney or carrot garlic chutney. Most South-Indian recipes are incomplete without the final master stroke given by the popular tempering of urad dal, chana dal and curry leaves. Since you just require 1-2 tbsp of oil, a small non-stick pan is the most ideal equipment to use. Be it a chutney, curry or subzi, the tempering surely enhances the flavor of the dish. Coconut Chutney, Tomato Chutney are some famous accompaniments to South-Indian breakfast delicacies like idli, dosa, appe. Also, you can cook Gujarati special Mixed Dal Handvo or Mixed Vegetable Handvo, a savoury pancake and serve it with green chutney. It is tasty and loaded with crunchy vegetables and makes up for a filling meal. Check our collection of 1762 Non-stick pan recipes and other equipemt recipe articles below.